How did the universe begin? And, once knowing, will we ever be the same? Imagine a time when the mysterious and fundamental secrets of the universe finally have been answered and are as accepted as knowing that the Earth is round. Imagine a world in which other dimensions are opened up to exploration, or that limitless energy sources finally solve the global crises we face. Experiments at the Large Hadron Collider (LHC), at CERN, near Geneva, Switzerland, are on the verge of potentially not only discovering those unsolved universal mysteries, but also of opening the door to a mind-boggling array of new technologies that may promise to eclipse the notions brought to us by the science of fiction. pioneers on the razors edge of tomorrow. We welcome Dr. Paul Padley, professor of physics at Rice University, and a lead physicist of experimental research for the LHC. Dr. Padley has agreed to become a regular editorial contributor to our feature: Portals  an open channel of communication with leading global thinkers from a variety of disciplines integral to our evolution as a species. Dr Padley also is joining our Board of Directors, as a science mentor and advisor. t-f/c: Can you explain what the Large Hadron Collider (LHC) is? Dr. P: The LHC is a particle accelerator which takes protons and accelerates them to 7 TeV protons crashing into 7 TeV protons (7 TeV energy is the energy a proton would have after being accelerated to 7,000,000,000,000 Volts), which is seven times more energetic than has ever been achieved before. [According to CERNs run plan for the next year, the accelerator will initially start at 3.5TeV on 3.5TeV and then will be raised to 5 on 5.] 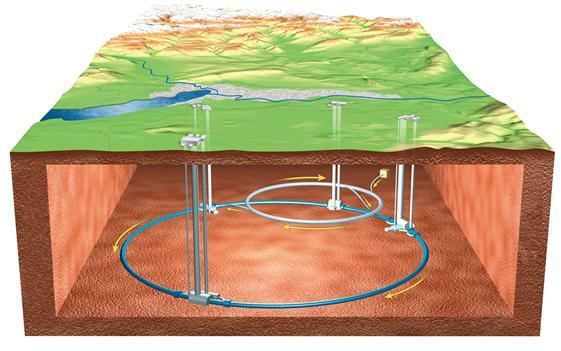 It (the Collider) will take two beams of protons, which are going in opposite directions, around the ring. They will hit, head-on and, in those collisions, new matter, new processes, should reveal themselves. This computer-generated image shows the location of the 27-km LHC tunnel (in blue) on the Swiss-France border. The four main experiments (ALICE, ATLAS, CMS, and LHCb) are located in underground caverns connected to the surface by 50 m to 150 m pits. Part of the pre-acceleration chain is shown in grey. or see processes taking place, that we havent seen before in nature. t-f/c: How do you make that assumption? and we cant explain what we see in the universe without invoking something that we call the Standard Model of Particle Physics. You cant explain where the elements come from, you cant explain where the quarks that make up the protons and neutrons come from, and how they interact, without using the Standard Model of Particle Physics. So, what were doing, at these high energies, is replicating a point in time, shortly after the Big Bang, where the energy density of the universe is comparable to the energy densities well have in these collisions. t-f/c: Still, the experiments begin with a basic assumption? Dr. P: Theres an assumption being made that the laws of physics today, are the same laws of physics that existed at the beginning of the universe. Its not totally outside the realm of debate, so people can call that into question. or, maybe, The Little Big Bang? and thats a complete mystery. So, for me, this is an opportunity. We dont know what 95% of the universe is made out of  lets try and make some of that stuff in the lab. In upcoming coverage of the LHC, well examine the importance of the research, the global cooperation required to mount this enormous effort of science and the potential applications of the discoveries made. at least, not the one you intended! As someone who is working on one of the LHC experiments, I would like to give an insiders view that is quite contrary. The major experiments at the LHC have been preparing to analyze the data that will be forthcoming when the LHC is turned back on. Of course no one knows, in advance, what will be found (you wouldn’t need to do the experiment if you already had the answer) and so the collaborations survey the theoretical ideas that are in existence and, using simulations, see how well they can test these ideas. They have produced large documents called Physics TDRs that survey all the ideas that have been put through this process. This is like a dress rehearsal for when the data will be available. For me, and most of my colleagues, this is the foremost goal of the experiment. In fact, this is even a bit self serving, because the greatest rewards in academia go to those who have challenged the status quo and had their ideas prevail. (Einstein was unable to get a job in academia until he had done so — he had to work in the Swiss patent office until then.) Like all good science, the ideas and results that come from the experiments will be scrutinized and challenged. However, the correct ideas will prevail. Most of us expect that there will be a revolutionary change in our view of the universe. Arthur G. Insana is Co-founder/Publisher & Editor-In-Chief of the-future.com.